Check out the new workshops at Studio Primrose! This is your day…How much you accomplish is all up to you! Sampling of our Previous Workshops! Family responsibilities have reduced the current workshop schedule. Please be sure to check back as new workshops will be added soon. Thank you for your support and understanding. We are so excited to bring you this workshop again in 2019! This workshop has SOLD OUT each time it is offered! This 24"x10" rustic wood plaque is power sanded and prepped in advance to leave "just the right amount" of texture. 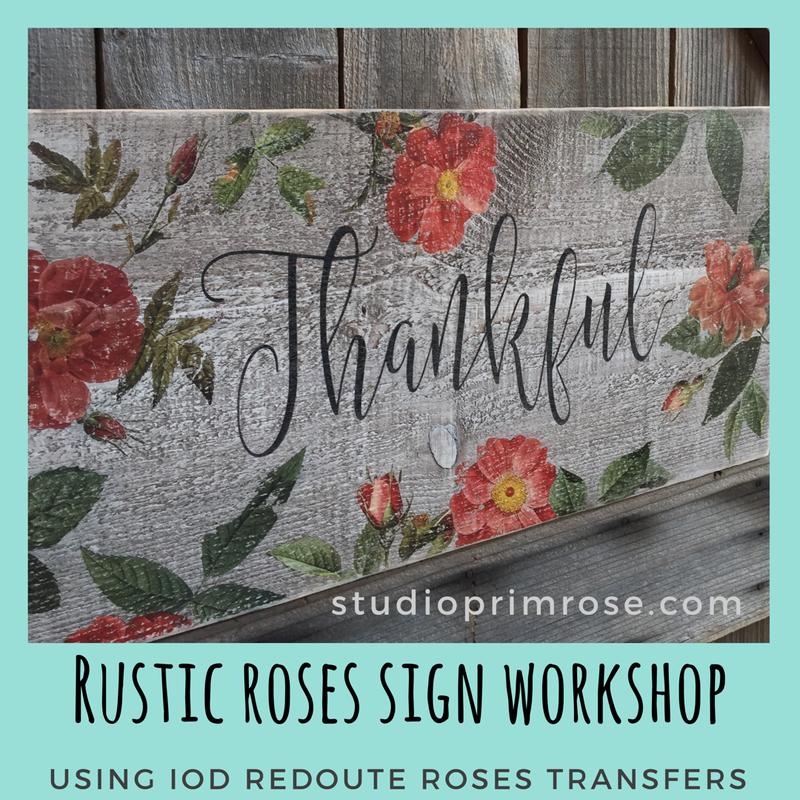 Once the plaque painting is done, get down to business stenciling your customized word or quote and applying either the Redoute roses or Sunflowers transfer set from Iron Orchid Designs! Each student will receive a set of their own to use wherever their creative whim takes them...and then take the remaining flowers home to make more beautiful projects. Woohoo! These transfers are so fun and easy to use...absolute instant gratification! Laura will be sharing her tips to make the application process easier and to avoid mistakes. Choose a customized quote to stencil on your individual sign. Laura will customize your own using up to 12 characters to easily fit the 24" wide sign. ​Tell us your "quote" preference in the notes section when you register. It's going to be so much fun! We can't wait to see you! Call Laura at 480-271-3881 to book a private group workshop! 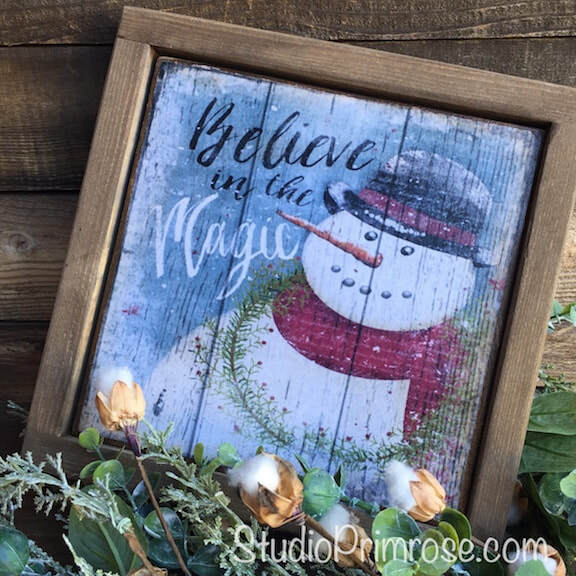 In this new and fast moving workshop, you will create the simple clean...yet lightly distressed..layered paint finishes you see and love on Instagram and Pinterest! You don't need to buy new furniture! Laura will show you how to renew and re-do your existing furniture easily and with confidence to fit your decor style. 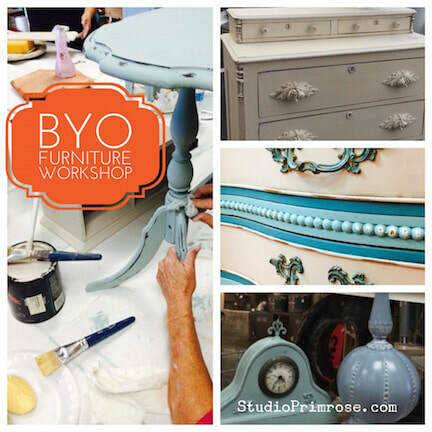 After discussing basic prep instructions, everyone will paint on molding and wood pieces using both Debi's DIY Paints (an awesome chalk & clay paint) AND Olde Century Colors milk paints. Experience how easy it is to layer paint colors, and then watch the magic as you rub back the top layer to reveal the previous stained or painted layers. Learn what products to use to protect your beautiful painted finishes. As the final touch, see what a little bit of wax or antiquing can do to switch things up a bit...Pure awesomeness! These top notch paints have their own nuances. Experience them for yourself and then choose the paint that best fits each of your painting projects! New!!! 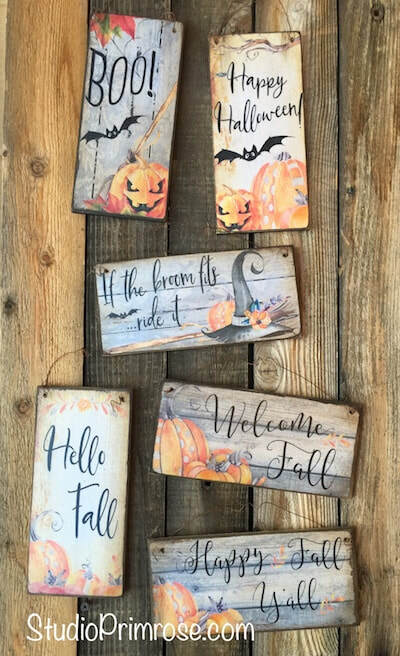 We will use Iron Orchid Design alphabet stamps and molds to make your paint samples into fun rustic signs...can't let a painted wood piece go to waste...right? - aging and distressing techniques (build on the techniques learned in the Intro workshop!) to accentuate the nooks and crannies. These products make the process so quick and easy! NEW!!! 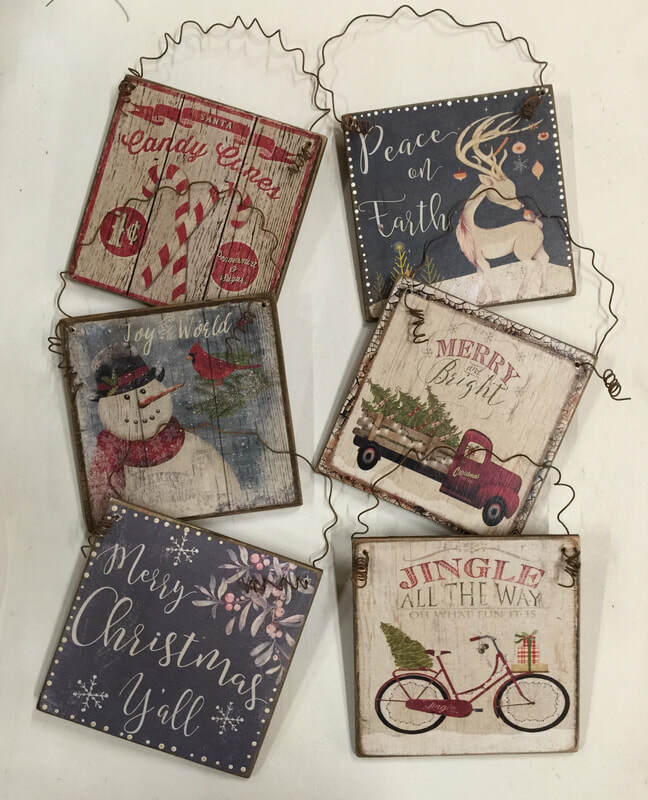 We will use Iron Orchid Design alphabet stamps and molds to make your paint samples into fun rustic signs......How fun is that?! This is your day…How much you accomplish is all up to you! Students have finished a chair (or 2), end table, lamp base, nightstand, etc. If you are super motivated, talk to Laura about bringing a larger piece and see how much you can accomplish in a day!!! You are welcome to bring an additional piece with you to work on if there is any “wait time” you want to fill and to keep busy. Some students have brought smaller projects for an easier painting day. 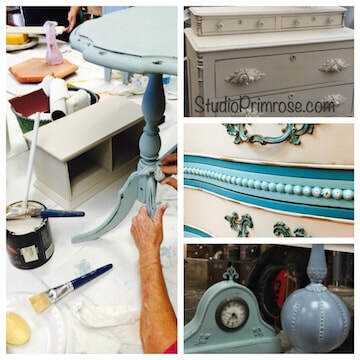 All of the paints and tools in Studio Primrose are available to you during the workshop to create your finish! Your painting experience, the size of your piece, and the complexity of your paint finish will all determine whether you complete your project during the workshop or if you may need to purchase the supplies to complete the project at home. Varnishing and/or waxing will need to be finished at home to give your gorgeous paint finish plenty of time to dry before the application of a protective finish. Early registration recommended…limited spaces avail! PLEASE bring any snacks or drinks to keep you going! ***To maximize your workshop time, your piece should be cleaned and prepped before the workshop! Intro to Furniture Painting is not required. If you have any questions regarding your project, Laura asks that you contact her before the workshop to discuss your furniture piece and what you would like to accomplish.